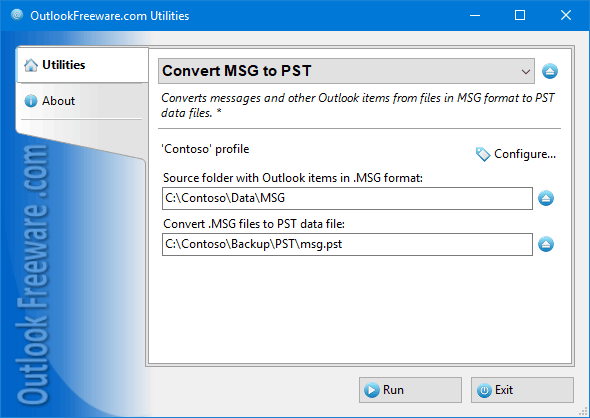 The free utility converts messages, contacts, appointments and meetings, tasks, notes, and other Outlook items from MSG files to PST. From a large number of MSG files in different folders, depending on the settings, you get one or more PST files. The free utility converts messages, contacts, appointments and meetings, tasks, notes, and other Outlook items from MSG files to PST. From a large number of MSG files in different folders, depending on the settings, you get one or more PST files. This creates the Outlook folder structure of the correct type. You can immediately split the resulting PST files by size, year, or other parameters. SynchPst for Outlook synchronizes outlook pst files quick and easy. You can choose single or multiple folders or subfolders to synchronize. Very easy interface. G-Lock EasyMail7 is a hybrid client-server email marketing solution for Windows that allows you to keep your contact lists and messages in-house, have full control over your lists, send email newsletters to your subscribers and track results. This free utility removes attachments from Outlook MSG files stored in the selected folder, including subfolders. The program allows you to specify the types of attachments to be removed and skipped and even parts of their names by mask. Professional Emaillist Verifier will extract all the emails from a small or large lists of emails and remove the invalid ones. It's extremly effective and powerful when it comes to handling large amounts of emails.